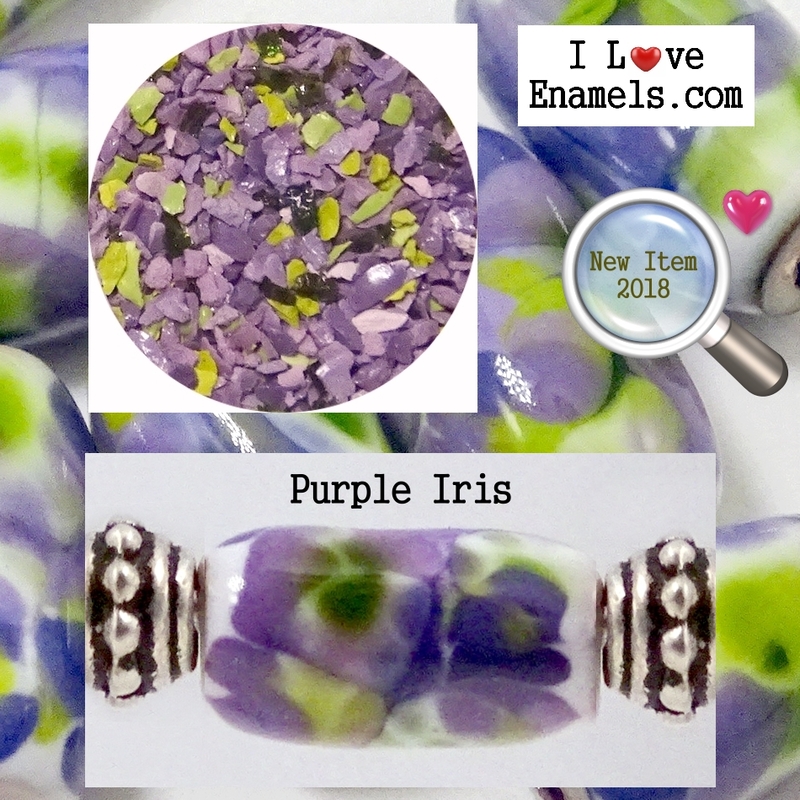 About I Love Enamels.com products: Our enamel products include, enamel frit, copper shapes and tools. All our products are for artist that work with torches and kilns. If you work with torch fired enamels or Kiln fired enamels, you will love using our enamel supplies. Our products are used to create, enamel art, enamel jewelry, enamel sculpture, enamel bowls, enameled light fixtures and enamel gifts. Your creative possibilities are endless with our colorful mixes. Our enamel frits can be used with all Thompson Enamel 1000 and 2000 series of enamels. You can use this enamel frit on Copper, Gold, Steel, Silver and PMC using torch fired or kiln fired processes. 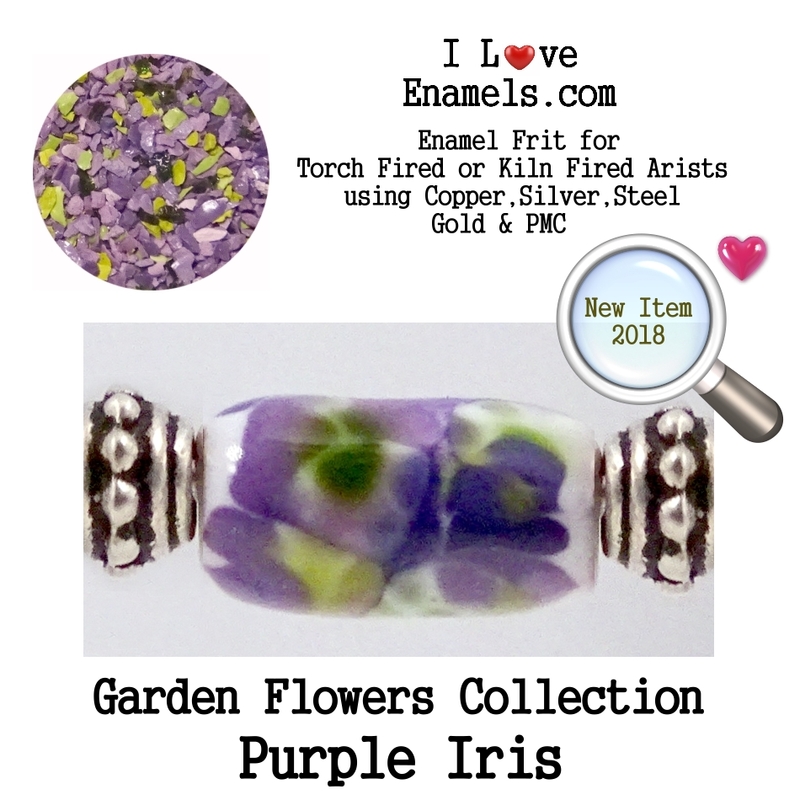 This Enamel Frit was created by my wife Cheryl Anne in June 2018. She loves any flowers in anyone's garden. ** This mix comes with 2 parts. Jars are 1 1/2 inches across and 3/4 inch tall, see through plastic. The bead/beads shown do not come with your order. The bead/beads are there to show you the color combination results. We can make beads for you if you desire using this color or any of other color of your choice. To have custom beads made for you, please email us for details and pricing. What size enamel mixes/ or frits are best for my needs? Our small size frits are used for copper shapes, PMC pieces and small beads made in the kiln or torch fired. Our medium size frits are used for medium size shapes, PMC pieces and medium beads made in the kiln or torch fired. Our large size frits are used for large size shapes, PMC pieces and large beads and outdoor sculpture work made in the kiln or torch fired. Why do the 2016 new colors cost more.? Well for over 40 years Joe purchased enamels with Thompson Enamel. He had a lot of stock of his original colors on hand that he could sell, at the prices he purchased from years ago. When we started testing for new color mixtures, unfortunately we had to purchase enamels at the higher prices. We needed enamel to make the mixes and we needed to purchase enamels from Thompson at the new prices. Which as you can imagine, prices from several years ago, were cheaper than they are now. This is just the way it is. We can't control that part of things. Sorry. Why is glass frit for bead makers cheaper than enamel glass frit? Enamel glass frit is made special to work with copper, silver, gold and PMC and metal clays. The cost to produce the enamel is more. Add to that bead making frit for 90-96-104 is sized. Thompson enamels come in 6/40 size. We hand shift each color, several times before we even start to make our mixes. A lot of love and labor there. But its so worth it. Remember, the enamel colors spread with heat, so little bit goes a long way. How the blends/mixes are used. Joe's Torch Fire Technique. 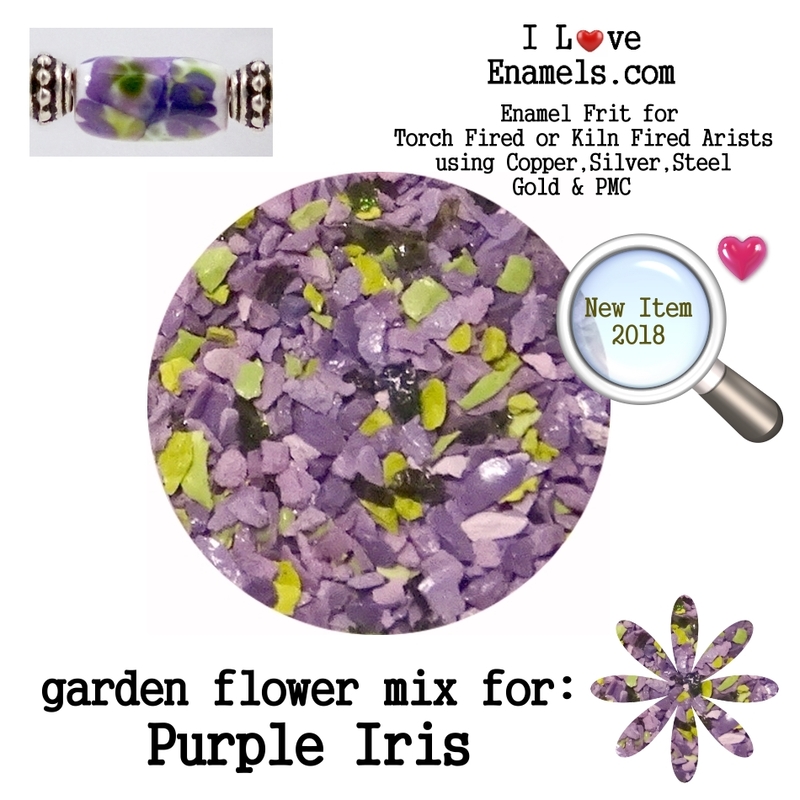 This is a short over all description of how this product is used to make copper enamel beads. Take your base coat and place 1/2 of the jar contents on your work surface. Take your color mix and place 1/2 of the jar contents on your work surface. Try to be careful not to mix the two piles on your work surface. * we use the line tool that Joe makes to keep the piles neat and separated. Using your mandrel, carefully heat your copper bead and then roll the copper bead into the base coat pile to cover your bead, fire. Repeat this process 2 - 3 times until you have completely covered your bead. The base coat is always used first. Heat the bead again and very carefully roll your bead into the color mix, and fire. Cool your bead in cooling tray. As your beads cool down, you will see color change, this usually takes a couple of minutes. This is normal. Common Sense and good safety practices will go along way. We can not be responsible for your safety. Always use proper equipment and safety gear when using any torch firing equipment. Please note: We do everything we can to try and produce photographs that show the true color as they appear in our studio. However your computer monitor and our monitor may not be the same.